This giveaway is sponsored by Silhouette. I’m seriously obsessed with jewelry. It always fits, regardless of my pant size, right? I have a ridiculous number of earrings and I’ve never seen a statement necklace that I didn’t like. The problem is that I have so much that I don’t “see” most of it. Part of my closet renovation plan is to put together a better jewelry display so that everything is right in front of me. 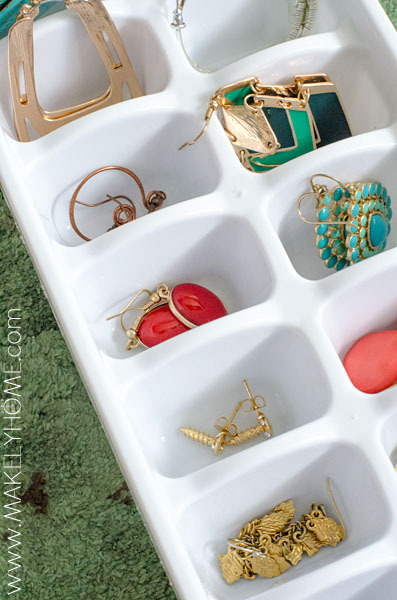 Towards that end, I found an earring storage solution on Pinterest that was brilliant. Ice cube trays, folks! Isn’t that genius? I bought stackable ones at Target so that I could stack them up and have a smaller footprint in my closet. I organized my earrings by metal tones, so I have one tray for gold, one for silver, and one for mixed metals. I thought it would be cute to label them, so I cut out labels from gold vinyl with my Silhouette Cameo. 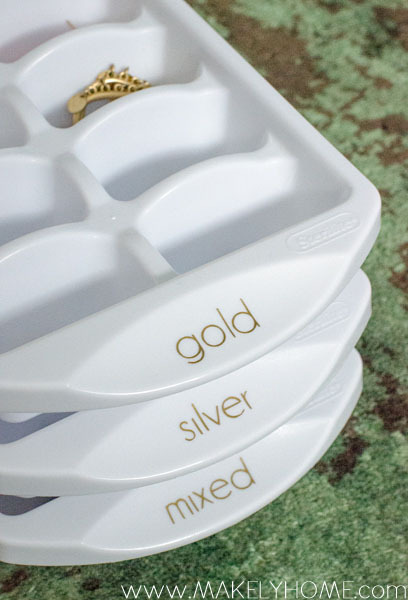 Now, the ice cube trays – I mean earring trays – are labeled so I know what’s in each one. Cute and functional, right? Gosh, I just love my Silhouette! 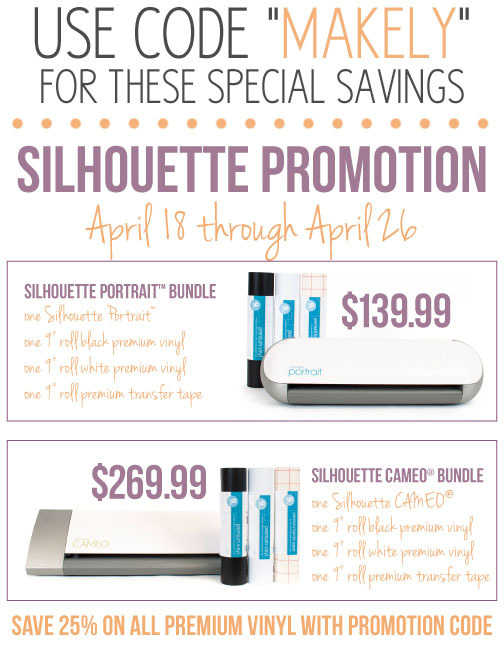 If you’ve been in the market for one, Silhouette has a great promotion going on right now. 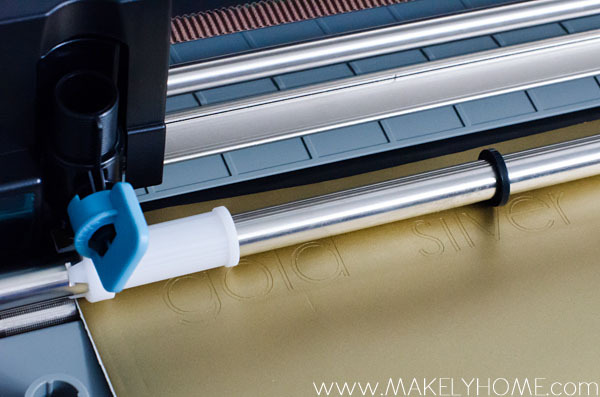 With the code MAKELY, you can get special pricing on a Silhouette bundle and/or vinyl if you already have a craft cutter. Usually the vinyl is $14.99 for a 9″ x 10′ roll. Silhouette has recently reduced that price to $9.99 and you get an additional 25% off of that – HUGE savings! It’s essential half off of the old price. And just in case you’d rather WIN a Silhouette…well, go right ahead. I’m giving away a Silhouette Portrait right here! To enter, follow my blog via a feed reader or get my posts delivered to your email inbox (links to do so are below in the Rafflecopter form). Fill out the form and you’ll be entered (if you are already reading on a reader, you need to click over to the blog itself to fill out the form). You can earn additional entries by tweeting, pinning and Facebooking this giveaway (you can do each once a day). The giveaway for a Silhouette Portrait will run through April 20th and is open to US residents only.